← Python module usage statistics – Cont. I actually wrote about that a long time ago, in the wiki that once was algorithm.co.il. Since the wiki is long gone, and I figured this is a very elegant algorithm, I decided I should write about it. First, some background – while writing Ascii-Plotter, I had to plot lines. To plot lines correctly I had to clip them. Now since this was a fun project, I decided I wanted to figure out how to do that myself, even though the problem is really solved. So I sat down with pen and paper, and did a little thinking, and I came up this nice algorithm. To find out the actual endpoints of the clipped line, we sort the six points according to their parameter, and take the two innermost points (with zero based indexing, those would be 2 and 3). What if the line is outside the box you say? We check that the result points’ parameters are between 0 and 1 (which correspond to the original endpoints). 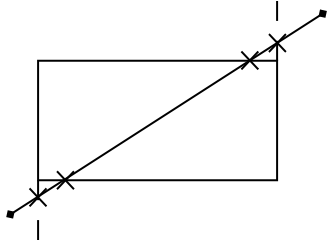 Note that for a line parallel to one of the axes, a similar method applies, but without two of the intersection points. However, it is probably easier to just calculate the clipping directly in that case. Here is some sample code, without all the surrounding checks (for parallelism with the axes, trivial clipping etc…). The full version is available in the code of Ascii-Plotter. This entry was posted in Algorithms, Geometry, Graphics, Math, Programming, Python and tagged Algorithm, Graphics, Line-Clipping, Python. Bookmark the permalink.